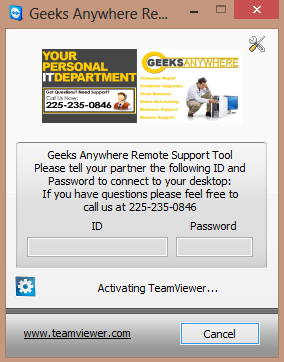 Click on the link below to download a trusted file that will start the client program allowing a Geeks Anywhere support technician to connect directly to your computer and assist in diagnosing and fixing any computer problems you may be experiencing. For additional assistance, give Geeks Anywhere a call at 225-235-0846 and we'll walk you through the process, and help you diagnose your computer problems. Download a Geeks Anywhere Trusted Application The Will Allow a Representative to Perform a One Time Connect to Your Problem Computer. 4. With the client running read the numbers in the fields below to the technician.